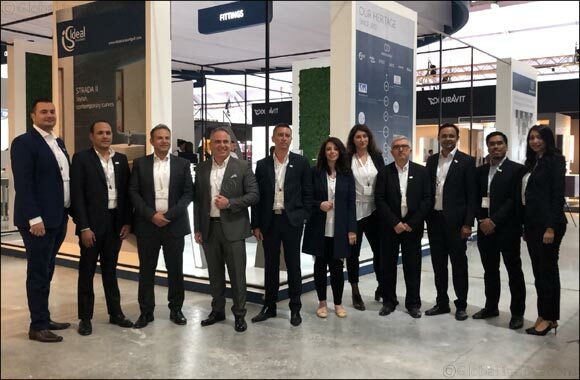 Dubai, UAE, November 15, 2018: Ideal Standard, one of the leading providers of innovative bathroom solutions operating across Europe, Middle East and Africa is showcasing its latest innovations and designs at the Downtown Design 2018 – Middle East’s trade fair dedicated to original, high-quality design. The fair is returning for a stellar sixth edition and it is organized in the Dubai Design District from November 13th -16th, 2018. Ideal Standard stand is representative of the brand identity and is divided into four distinct areas. Three areas are dedicated to product display, while the fourth adds to the interactive feel at the exhibition by accommodating a virtual reality experience. Using a VR kit, visitors have the opportunity to experience a fully equipped virtual Ideal Standard bathroom, and walk through it while examining the world-class solutions on offer. That enables architects, designers as well as consumers to have an amazing experience that transcends the limitations of the 130 m2 stand. Also, available on location will be a “digital table” that will work as a notebook and offer a treasure trove of information about Ideal Standard. Ideal Standard’s stunning display is driven by the objective to give prominence to trend setting design and product innovation. Its latest product portfolio is presented – the Strada II stylish and versatile ceramic range, Edge & Ceraline mixers, along with Ipalyss vessels and Idealrain Evo showers. Created by leading industrial designers at Studio Levien, Strada II ceramic range offers a soft, light design in line with current tastes and trends. It consists of a flexible basin range, with options to fit every design scheme in a range of sizes and models. Options include washbasins, vessels, vanities, under and semi-countertops in sizes ranging from 40cm to 120cm. Additionally, one can choose from wall-hung, floor-standing and close-coupled toilet bowls, along with wall-hung and floor-standing bidets. Cleanliness is vital when it comes to the bathroom and toilet bowls, which is why Strada II features the patented AquaBlade® flush technology. It provides a more effective and efficient use of water, while improving flushing even at low water volumes, with no impact on the design. Ideal Standard is bringing to the fore the winner of German Design Award 2019 Edge - its new minimalistic collection of mixers – inspired by a return to the essential in design and architecture, with an emphasis on quality materials and simple geometric shapes. With a clean, continuous shape, Edge blends seamlessly to its design environment and gives a much needed versatility. Discover mixers for the bath, shower and basin in this wide range for every configuration and function, with varying heights and features. Environmental and economic benefits come from the use of 5l/min regulators, Click technology and hot water limiter, which minimize water consumption without impacting on your experience. Following a cylindrical design pattern, a prominent present-day trend, Ceraline range of mixers has a soft and stylish elegance that will fulfil aesthetic and functional demands. It checks the ‘versatility box’ too! With six different basin mixers, both rim-mounted and built-in, with bidet, bath and shower mixers wall mounted and built-in, there is no need that remains uncovered. Ceraline is not only beautiful, but also a reliable solution for the bathroom, with amazing water saving and safety features. Basin mixers are equipped with a 5l/min aerator that reduces water consumption with no loss of flow, to perform in the most demanding environments, while reducing the bill. The company will also exhibit Ipalyss, its very unique range of vessels, featuring the latest innovation in ultra-thin ceramic material, Diamatec®. This patented new material was developed using a unique blend of specially refined materials, resulting in exceptional robustness that allows designers to achieve the near impossible: extremely thin, straight edges that are extremely robust and durable. These products are especially well suited for demanding environments, such as hotels, where an effective combination of aesthetics and durability is of paramount importance. To complete its wide array of solutions, Ideal Standard displays IF & Red dot award winner Idealrain Evo, a wonderful addition to the already successful Idealrain showers. The collection offers advanced technology and eye-catching designs with a unique user showering experience. A central design and function element is the flush integrated push button for activating spray modes that will suit every individual need. Engineered in Germany, Idealrain provides efficiency, with no loss of experience for users. All handsprays feature an in-built flow regulator that reduces water consumption in high pressure systems to just 8 L/min without impacting user experience, while the precision-designed flow engine delivers optimal spray performance. The company, associated with some of the most prestigious projects in the Gulf, is committed to reinforce its market presence with its adherence to product quality, innovation, design and sustainability leading to functional bathroom solutions, which meet every demand where aesthetics are as important as performance.